Anna comes to fetch Maigret from the train when he arrives in Givet. The station is still on the same spot as 1930-32. In 1940, at the start of World War II, it was destroyed by bombardments. It was rebuilt after the war. "- In which hotel do you stay? Inspector Machère, the local police officer who assists Maigret in his investigation, stays in this hotel. There never was an hotel with that name in Givet. In Simenon's time the hotel opposite the train station was called Hôtel Autoplace. It is now the Bar - Hôtel - Restaurant des Deux Avenues. It is very simple and a little bit seedy-looking, but the food is marvelous. These days there is only one business next to the bridge that could be the allotted hotel: the very classy Restaurant Maison Baudoin. Today it is not an hotel anymore, but it was in Simenon's time. Then it was called Auberge de l'Europe. "The young people generally meet in the Café de la Mairie!" In this café Maigret has a scuffle with the young Gérard, brother of the murdered Gérmaine. It is to be expected that this café must be situated near to the town hall. The square that is described by the author is the present day Place Carnot. In Simenon's time it was called the Place de la Meuse. There is a café on the corner of a small street, to the right hand side, facing the town hall: the Brasserie de l'Hôtel de Ville. Because of the similar designation it is tempting to classify this business as the café from the novel (Hôtel de Ville = Mairie). It almost certainly is not. The Café de la Place, the Café de la Mairie in the novel. Old postcards show that on the spot where today is the Brasserie - Hôtel de la Mairie, there was a store, not a bar. However, on the other corner of the same small street there was a café, the Café de la Place. This must be the Café de la Marie from de novel. One could observe especially well the corner of the lane where the Piedboeuf family lived in the second house on the left." 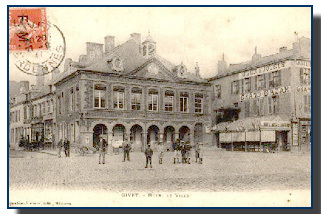 Although the Ardennes are mainly an area of forests and hills, the immediate vicinity of Givet was rather industrialized. In the first half of the 20th century the town was inhabited by poor laborers who worked in the factories and quarries. Most of the small working-class houses have disappeared and have been replaced by large apartment buildings. In some quarters the typical dwellings can still be found but not on the spot where the home of the Piedboeuf family most have been situated, close to the Café des Mariniers in one of the bystreets of the quay along the river at about 100 meters of the Hôtel de la Meuse (now the Restaurant Maison Baudoin). The factory where the murdered Germaine's father works and where Maigret goes to talk with the embittered night-watchman is on the right bank of the Meuse river. It is still there as well as the wall, only not whitewashed anymore. The present-day factory (Sopal) is producing adhesive paper to imprint with postal and fiscal stamps. The factory on the right bank of the Meuse, in front of the houses the wall. The main localities mentioned in this novel are all recoverable, although all names have been changed. The only deflection is the distance between the town center and the Flemish shop. In order to permit Maigret to walk from one spot to the other, as he always does, in the novel the shop was situated at 500 meters from the bridge instead of the actual 4 km. (2) Georges Simenon,Chez les Flamands, 1932. Excerpts translated in English by G.de Croock out of the 1978 edition, Pocket, Paris.